These candles are also our personal favorites. 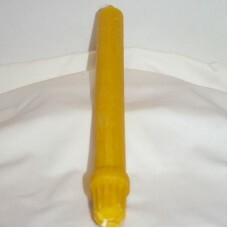 They are 10 inch colonial-style tapers, and look lovely in candle holders. They smell beautiful as they burn. These tapers are sold in sets of two, and are made of unfiltered beeswax. You can see and smell the propolis!